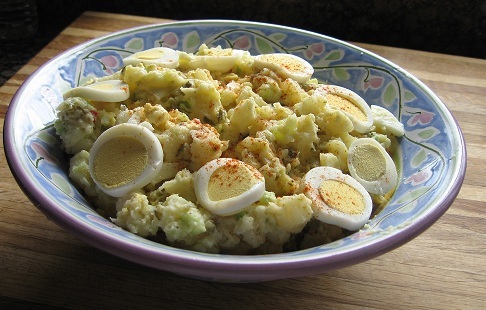 A wonderful potato salad recipe from a sweet lady I met in Utah. Tastes just like my grandma's potato salad from when I was a kid. Boil the potatoes for about 20 minutes until soft. At the same time steam the eggs until hard (see my instructions for "Hard Steaming Eggs") then cube up 3 1/2 of them. Slice the last half of an egg for garnish on top of the salad. Place cubed potatoes and cubed eggs in a large mixing bowl. In a smaller bowl add the following ingredients. Salad dressing, sour cream, green onion, dill pickle and Morton Season All. Pour into the larger bowl containing the potatoes and eggs. I usually make a very large salad for gatherings but have tried to scale the recipe down for a more economical dish.